Check out a freshly posted Health Wonk Review: The Turkey Edition at HealthBlawg. David Harlow hosts and it is chock full of good content and some fun seasonal links to boot – mosey on over to take a gander, pilgrim! Keeping two sets of books has come to be the cliche for fraud and deceit. You expect it to be confined to the realm of cartoon villains, but it was one of many damning indicators reported to inspectors during a more than four-year investigation into circumstances surrounding the mining disaster that claimed 29 lives at the Massey-owned Upper Big Branch Mine. One book especially for the inspectors, one book for operations. Yesterday was the day that many of the surviving family members thought would never come. Longtime Massey CEO Don Blankenship was indicted on four criminal counts: three felonies and one misdemeanor, which carry a maximum combined penalty of 31 years imprisonment. “A federal grand jury in Charleston charged Blankenship with conspiring to cause willful violations of ventilation requirements and coal-dust control rules — meant to prevent deadly mine blasts –during a 15-month period prior to the worst coal-mining disaster in a generation. Ken Ward, Jr. has been covering this in great detail both in the Charleston Gazette and on his Coal Tattoo blog. See his Blankenship indicted post – he links to a timeline of events, reactions of family members, a summary of convictions so far. Cavalcade Of Risk #221,: Birds of a Feather – Claire Wilkinson of Terms + Conditions hosts this weeks’ biweekly roundup, and it’s a good one! First up: Peril, and Daring, at 1 World Trade Center as Window Washers Are Trapped – Dramatic photos and reports of yesterday’s rescue via the New York Times. Today’s report: Workers Rescued From Dangling Scaffolding “Doing Well”, which includes footage of the rescues. Good job, first responders! 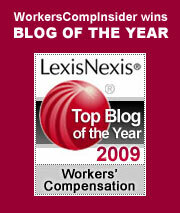 A workers comp must-read. The International Association of Industrial Accident Boards and Commissions (IAIABC) featured a “point-counterpoint” type presentation in its annual Peer Review Journal. This edition features John Burton, Professor Emeritus at Rutgers and Cornell, and presidentially appointed Chairman of the 1972 Federal Commission on Workmen’s Compensation and Robert “Bob’s Cluttered Desk” Wilson, workers comp internet entrepreneur/visionary and President and CEO of workerscompensation.com. Burton’s article “Should There Be a 21st Century National Commission on Workers’ Compensation Laws?” suggests a direction for the future and Wilson’s article “The Case for Workers’ Recovery” suggests a philosophical change for the industry. Download and read the series of articles. WorkCompWire: NCCI Publishes Workers Compensation Financial Results Update – NCCI’s State of the Line report indicated favorable industry results for 2013. Industrywide statutory data for 2013 indicates little difference between NCCI’s preliminary estimates and the final results for most of the major financial measures. For Calendar Year 2013, NCCI initially estimated workers compensation premium volume net of reinsurance to be $37.0 billion for private carriers. This compares to the actual data reported by the industry of $36.7 billion. NCCI estimated an industrywide workers compensation combined ratio of 101 for 2013; actual data reported by the industry indicates a combined ratio of 101.3. 9. (You can access and download the full report free: NCCI Workers Compensation Financial Results Update. – Bob Laszewski: Is the Administration Low-Balling Their 2015 Obamacare Enrollment? Who insures short-duration work-injury caused absences? “…to help employers, managers and supervisors, human resource professionals, and employee assistance program (EAP) providers relate to and support their employees who are Veterans and members of the Reserve and National Guard. For more information on the clip, see the description under the video at YouTube. If you’re thinking of this as a possible career path, see The Salary of a High Voltage Cable Inspector. But be aware that robots may be encroaching on your career aspirations. Waiting for your biweekly dose of health wonkery? Wait no more – Jennifer Salopek has a fresh post at Wing of Zock – Health Wonk Review: The Election Week Edition. Topics include the ACA, Ebola, MD kickbacks, venture capital healthcare investments & more – check it out. As we approach the holiday season and millions of Americans plan for poultry as a dining choice, OSHA has cited Wayne Farms for a variety of serious worker safety violations. While these types of citations constitute news that is generally only of interest in the health and safety circuit, they speak much more widely to general public health issues that should concern us all. Celeste Monforton reports on the OSHA’s findings of serious and repeat violations for “prolonged repetitive, forceful tasks, often in awkward postures for extended periods of time” and gross deficiencies in the company’s lockout/tagout procedures, a violation that had previously been leveled at one of the company’s other processing plants. The health and well-being of food processing workers is inextricably linked to important public health considerations. Injured, over-tired workers are not a good front-line defense against salmonella and other dangerous food contaminants. Last year, the USDA was considering a proposal to speed up bird processing from an already demanding 140 birds per minute to 175 – see our post USDA: What’s up with your “for the birds” food processing legislation? After a two year battle over the issues, the Agriculture Department finally dropped the proposal this past July. On the other hand, the USDA also privatized and decreased the number of food inspectors and failed to act on antibiotic-resistant salmonella, so it wasn’t all good news. The human cost of bringing poultry to the table .